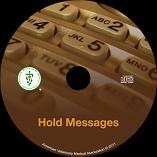 Does your veterinary practice have telephone “on hold” messages that educate and inform your clients? The AVMA is now offering professionally produced messages that will engage and entertain your clients while they’re on hold. Topics differ from month to month, and each message is designed to enhance client loyalty and drive traffic to your business. Free digital files are available to download immediately, or you can purchase the entire year on CD.